Every year we know of two or three murals which are demolished. Most of the destruction happens because the mural is sited on a building which is about to be pulled down due to redevelopment. A few are lost due to circumstance; for example, the Tramshed Mural by Greenwich Mural Workshop was destroyed in the 2011 riots in Woolwich . So we were sad to learn of the destruction of the Highbury Grove Mural in north London which was removed by the housing department of Islington council. This was in error as the arts department were to raise funds to repair the mural with the assistance of two of the original artists, Diana Leary and Karen Gregory. 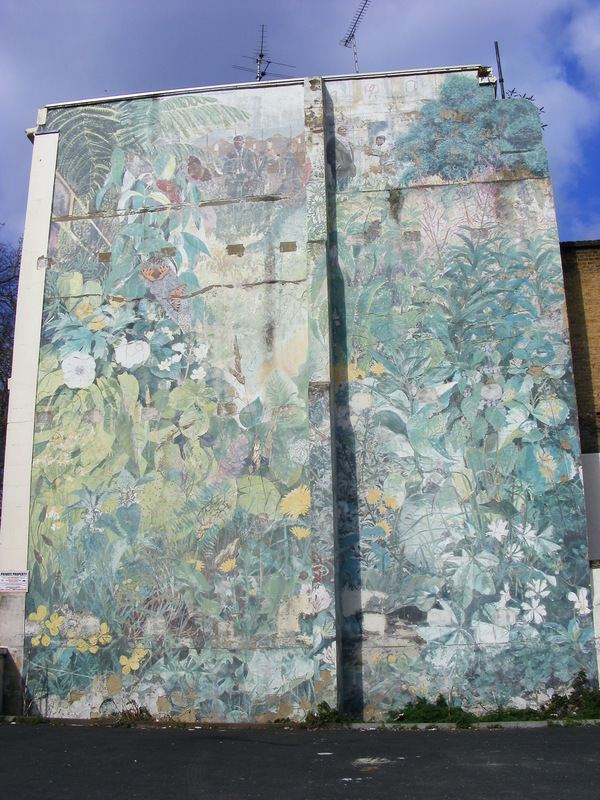 The mural, painted in 1987, was created by Dave Bangs and featured wild plants and insects found in the surrounding Islington area. It also featured portraits of some of the people who were attending the school at the time. During the past few years, members of the local Highbury community have emailed the London Mural Preservation Society (LMPS) about the mural’s situation as they were aware that the painting was very faded and this could lead to its destruction in an attempt to improve the appearance of an area. However the local Liberal Democrats have been keen to see the mural repaired and last year we met to discuss plans for the painting’s repair. Local residents are feeling pretty upset about the loss of this wonderful artwork but things might not be too bleak. According to the Islington Gazette, the council have vowed to replace the mural. Hopefully this means the repainting of the original design rather than the creation of a new piece. The artists would like a particular type of render to be used on the site so that the mural can be repainted in Keim paint which should keep it in a good condition for many decades. We are hoping that funding can be found to make this happen and that the council fully understands the value of this particular murals. If you want to support the campaign to get it reinstated, please sign this petition. This entry was posted in London Mural Preservation Society, Restoration and tagged Dave Bangs, Diana Leary, Islington, London, Mural, murals. Bookmark the permalink. This is shocking news, I used to go past that mural on the bus home from school. I have signed the petition and shared with the ghostsigns community so hope that a solution can be found. Thanks for highlighting its plight.